My son is not a professional athlete. After all he’s only 15. But he is a good, not great, but good high school runner. He was good enough though last year to win a local 5k race where most of the participants were more focused on throwing colored chalk on each other than breaking the tape at the finish line. One of the other runners that day was a friend of ours 3rd grade son. Whatever this kid might lack in size he more than makes up for in heart. He is a born competitor and also ran the race all out. On hearing the news that a guy he knew crossed the finish line first, well, let’s just say Ryan earned his first young fan! This last weekend we visited our friends lake house. Sunday was Ryan’s only scheduled day off. 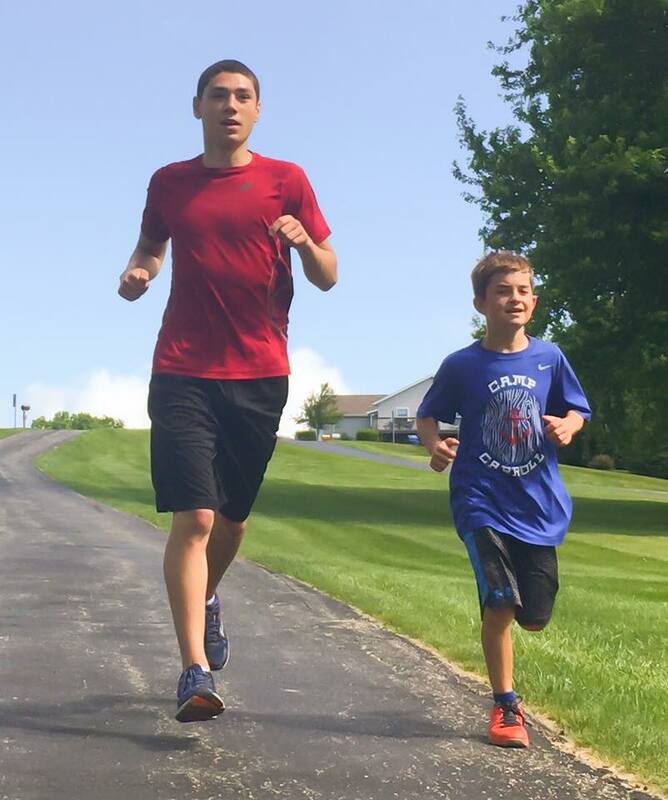 His off season program has him turning in 40 to 60 mile weeks in preparation for his Jr. year of Cross Country this fall. That morning however Ryan’s youngest fan had other plans mainly a training run with his idol. That’s why at 6:30 am as I sat alone on the porch coffee in hand the first person I saw was little Charlie. Not only was he up but he was dressed and ready to run! About the cutest thing I ever saw was this eager beaver pipsqueak stretching and warming up in front of me continuously inquiring on when exactly Ryan would be waking up! Kid (I thought to myself) he’s a teenager, you’d be lucky to see his face before the afternoon! I mercifully gave Ryan an extra hour of shut eye before rousing him from his sleeping bag. Without complaint (the kid never complains about anything EVER!) Ryan rose, slipped on his shoes and was out the door his little buddy in tow. My son may or may not win another race his high school career and I could care less. He’s a role model and a worthy one at that in a world that’s starving for the right kind of role models. Charlie will be playing football this fall. Something tells me Charlie is going to have a high school running fan of his own there cheering him on.